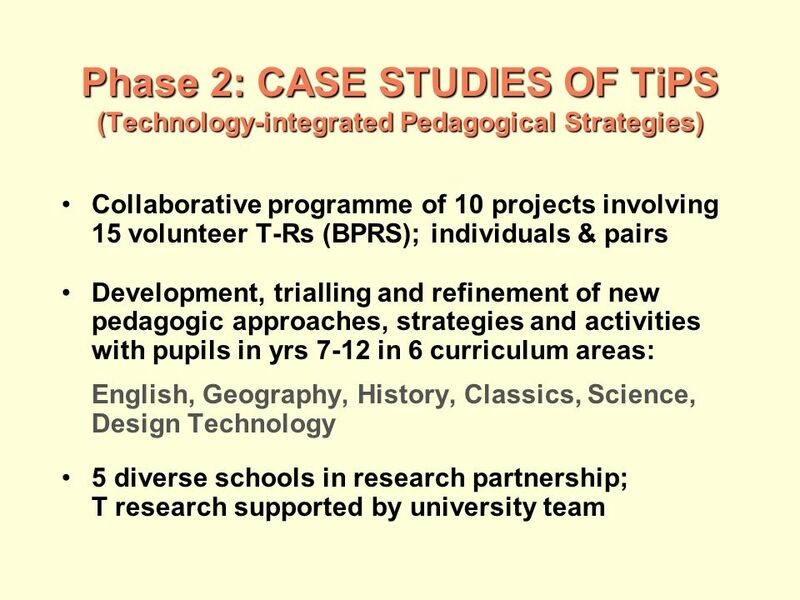 4 Phase 3: ANALYSES WITHIN AND ACROSS CASES (interacting) Analyses drew on our observations, interviews, T research reports, documentary evidence Q:How do teachers create the conditions which support subject learning with ICT? 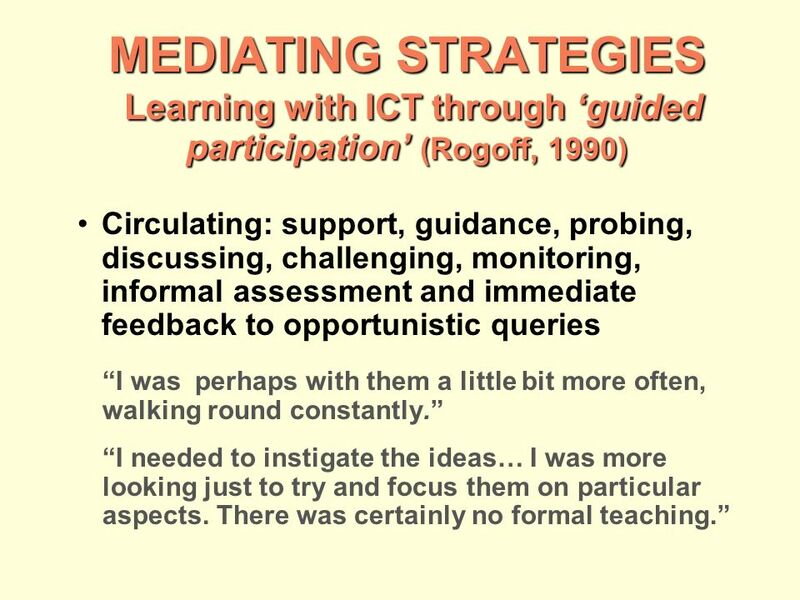 7 MEDIATING STRATEGIES Learning with ICT through guided participation (Rogoff, 1990) Circulating: support, guidance, probing, discussing, challenging, monitoring, informal assessment and immediate feedback to opportunistic queries I wasperhaps with them a little bit more often, walking round constantly. I needed to instigate the ideas… I was more looking just to try and focus them on particular aspects. 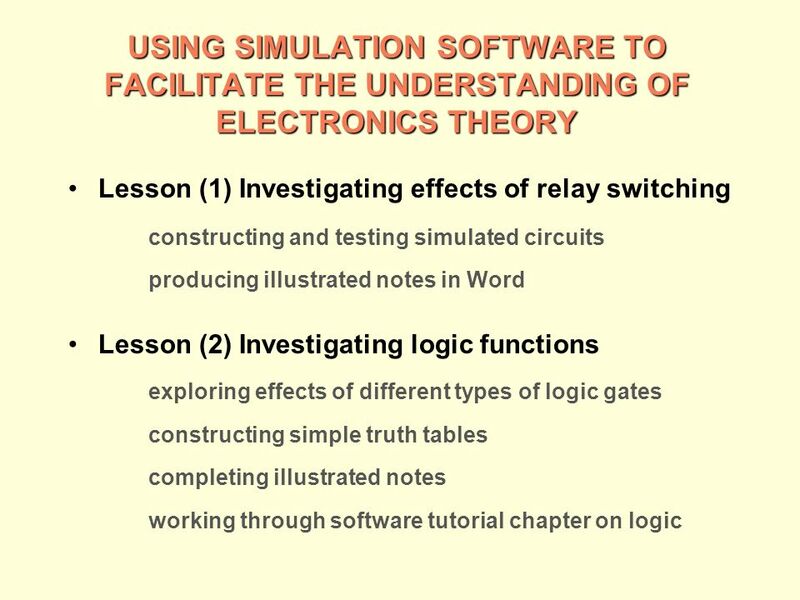 There was certainly no formal teaching. 16 CHANGING AND VARIED TEACHER ROLE CHANGING AND VARIED TEACHER ROLE Teacher freed from storekeeping to deal with what was going on in their minds Providing framework of support by: introducing topic: demonstration, task instruction facilitating: encouraging exploration; prompting pupils to find their own solutions and make mistakes and learn from it focusing: they can see what happens when things are connected wrongly; pupils less reliant on me to go round saying Thats not going to work, that is. 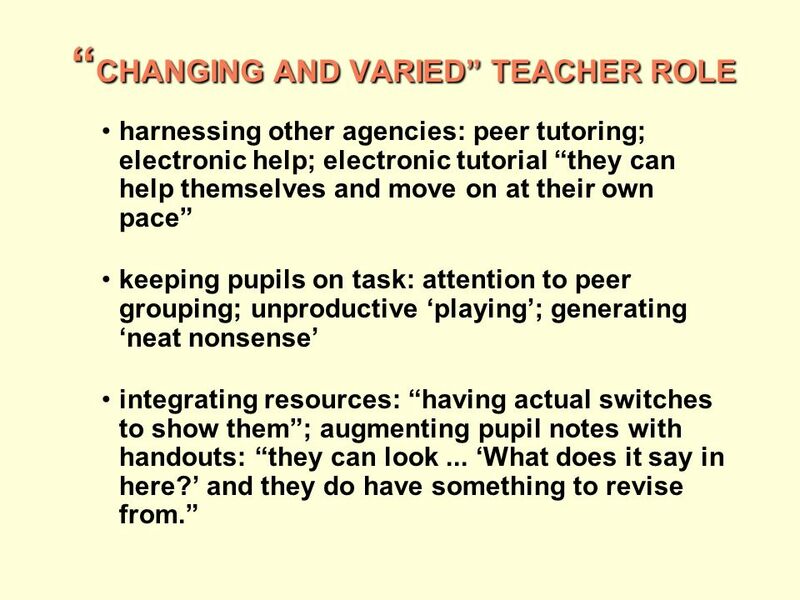 17 CHANGING AND VARIED TEACHER ROLE CHANGING AND VARIED TEACHER ROLE harnessing other agencies: peer tutoring; electronic help; electronic tutorial they can help themselves and move on at their own pace keeping pupils on task: attention to peer grouping; unproductive playing; generating neat nonsense integrating resources: having actual switches to show them; augmenting pupil notes with handouts: they can look... What does it say in here? and they do have something to revise from. 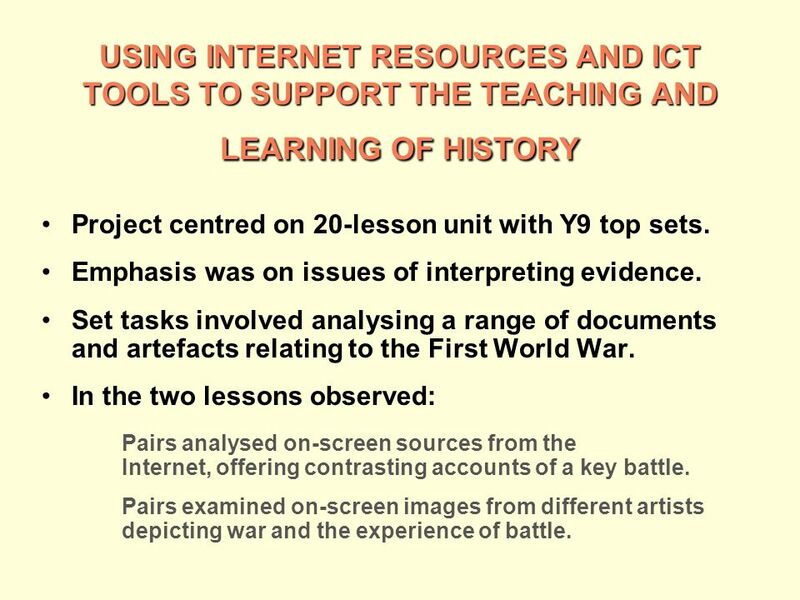 18 USING INTERNET RESOURCES AND ICT TOOLS TO SUPPORT THE TEACHING AND LEARNING OF HISTORY Project centred on 20-lesson unit with Y9 top sets. 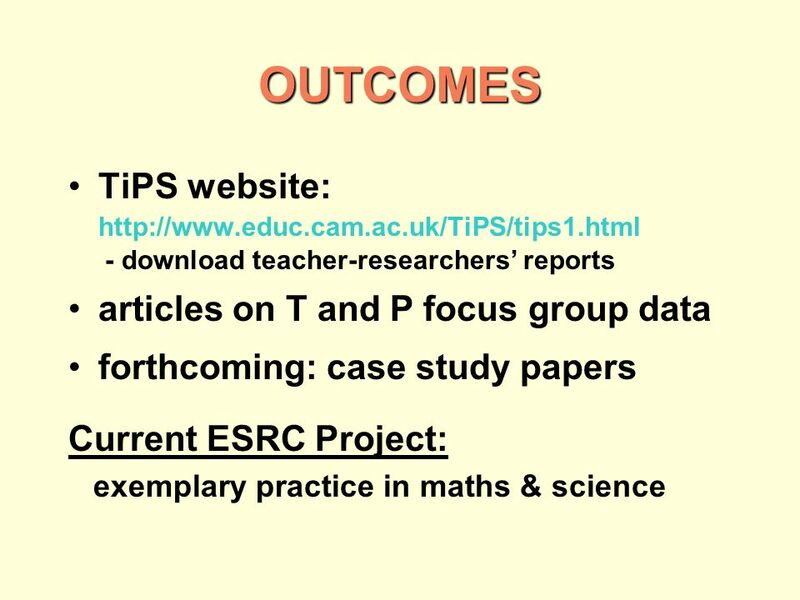 Emphasis was on issues of interpreting evidence. Set tasks involved analysing a range of documents and artefacts relating to the First World War. In the two lessons observed: Pairs analysed on-screen sources from the Internet, offering contrasting accounts of a key battle. Pairs examined on-screen images from different artists depicting war and the experience of battle. 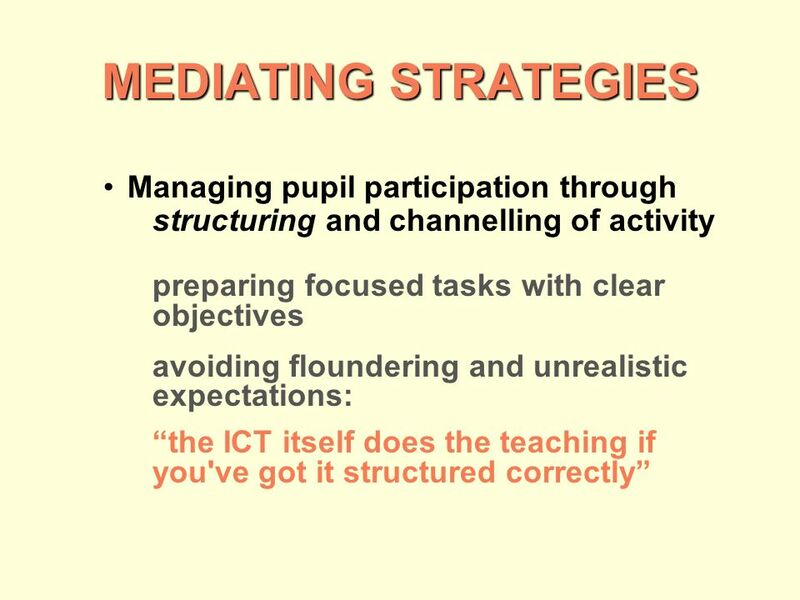 19 PROVIDING STRUCTURE AND SUPPORT FOR LEARNING WHILE PRESERVING PUPIL AGENCY Internet resources were selected and adapted to create a virtual archive on the school intranet. 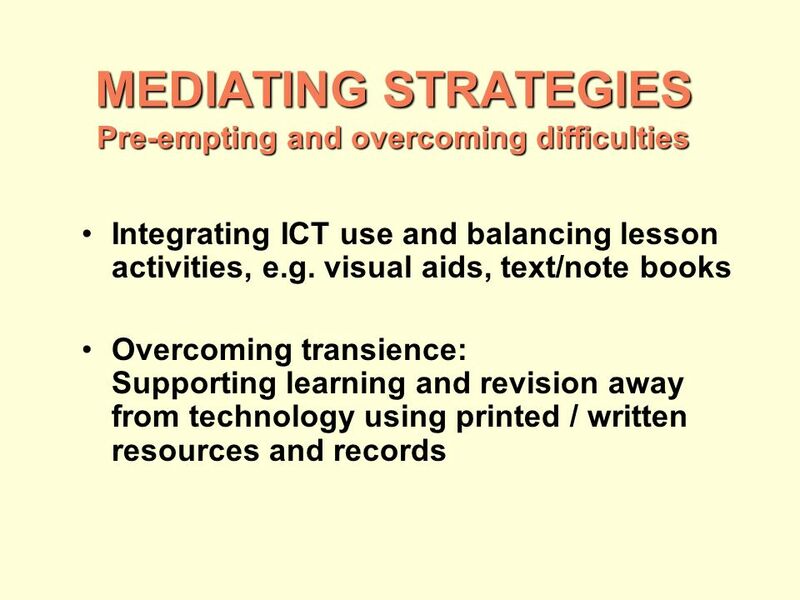 Pupils were able to dictate to some extent the pace of work on tasks, and a lot of the time they were free to discuss, at whichever level. 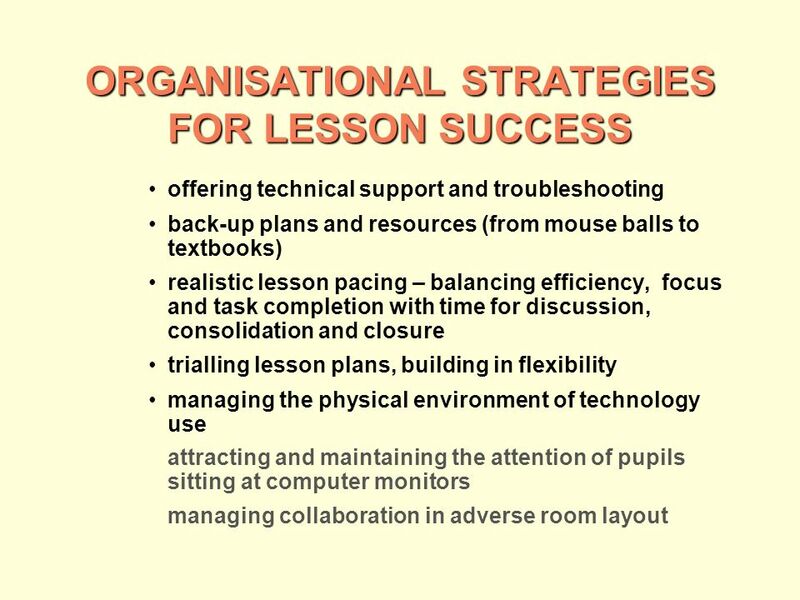 But teachers also noted their own contribution in going around… and feeding them ideas, asking questions and trying to move them on. 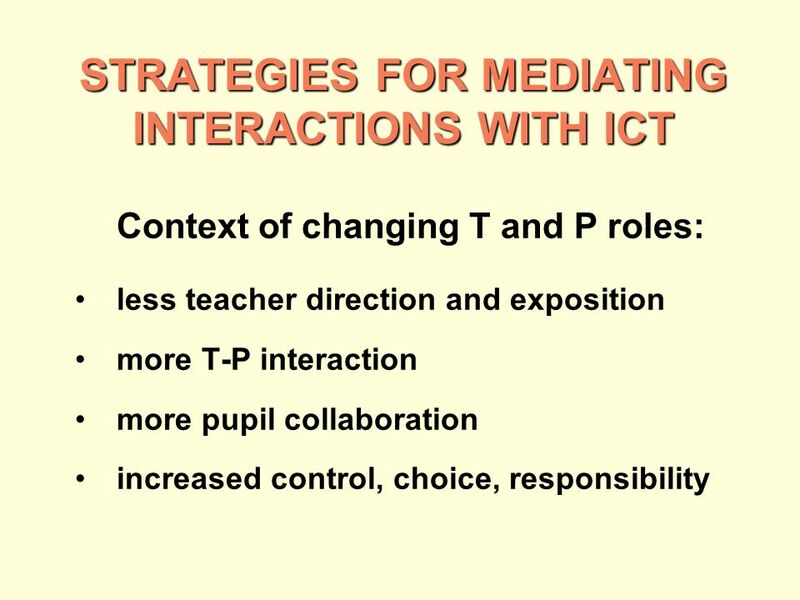 Having on-going work on-screen facilitated teacher joining discussion between pupil pairs. 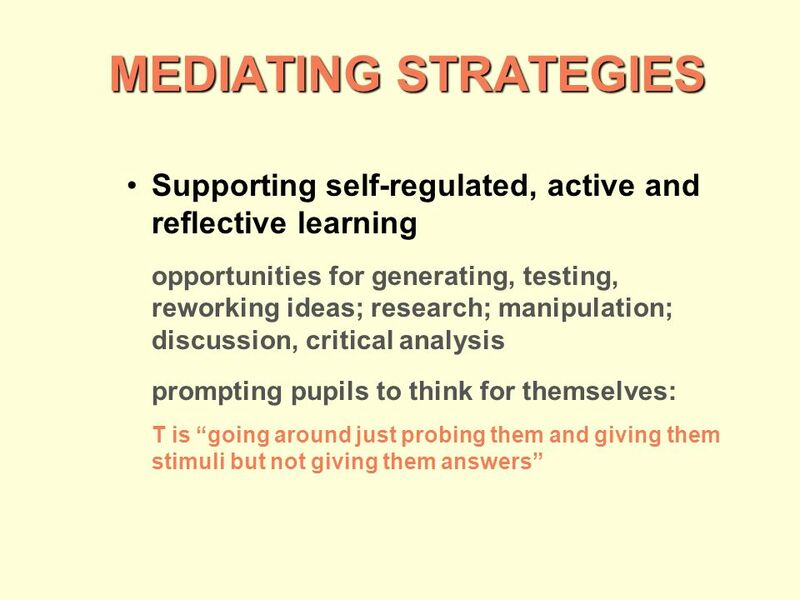 Overall, the teachers perceived themselves as far less didactic in [their] approach within lessons. 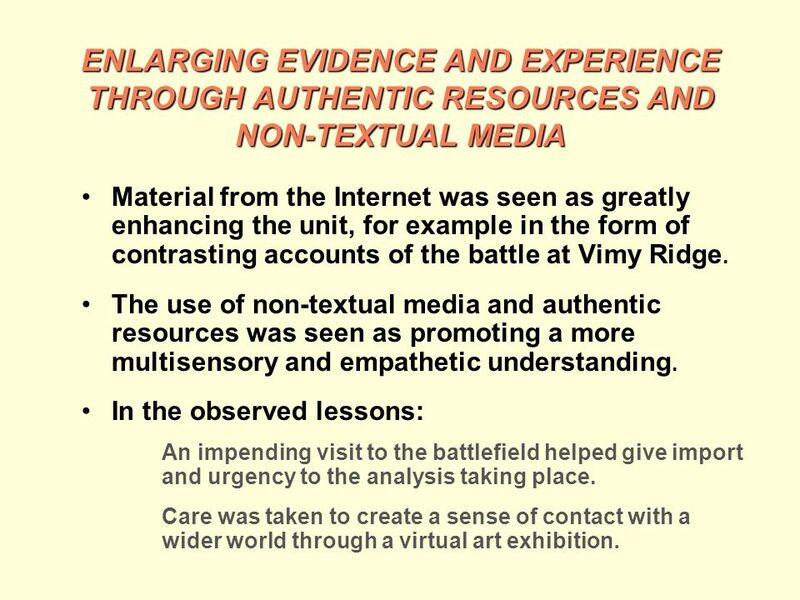 20 ENLARGING EVIDENCE AND EXPERIENCE THROUGH AUTHENTIC RESOURCES AND NON-TEXTUAL MEDIA Material from the Internet was seen as greatly enhancing the unit, for example in the form of contrasting accounts of the battle at Vimy Ridge. 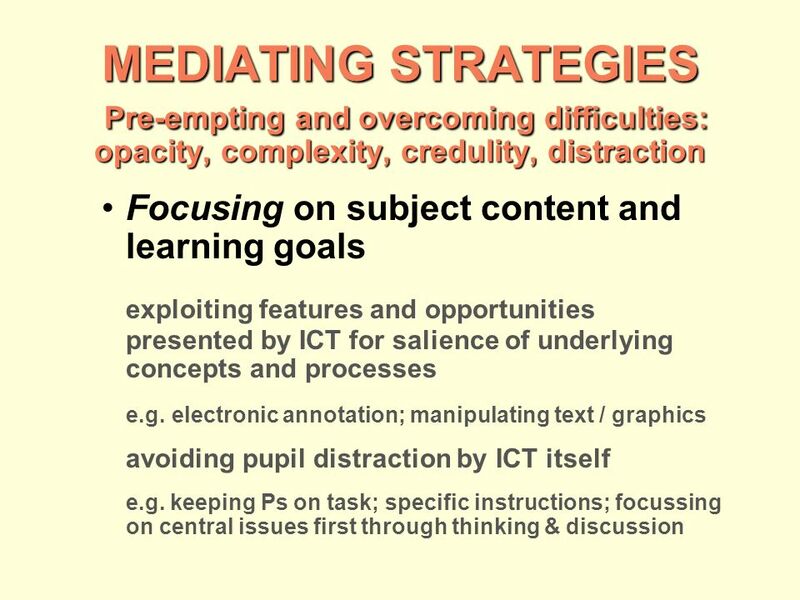 The use of non-textual media and authentic resources was seen as promoting a more multisensory and empathetic understanding. In the observed lessons: An impending visit to the battlefield helped give import and urgency to the analysis taking place. Care was taken to create a sense of contact with a wider world through a virtual art exhibition. 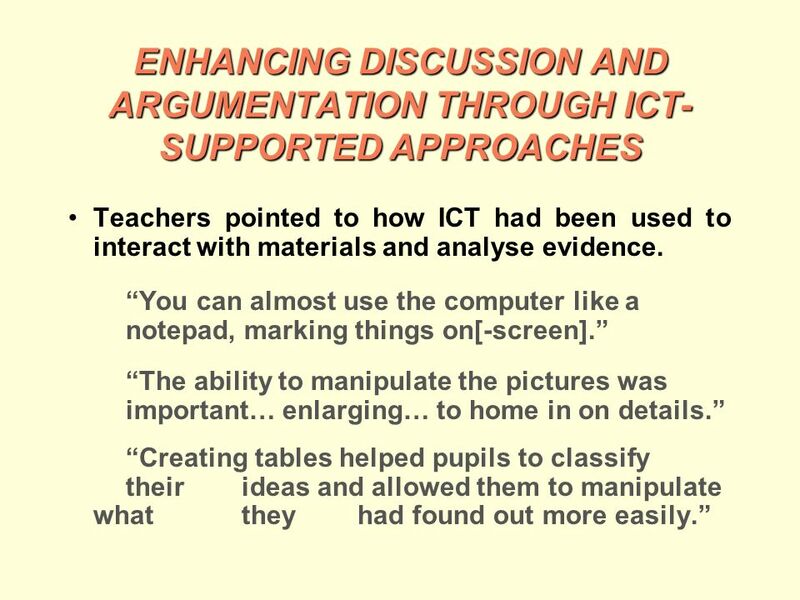 21 ENHANCING DISCUSSION AND ARGUMENTATION THROUGH ICT- SUPPORTED APPROACHES Teachers pointed to how ICT had been used to interact with materials and analyse evidence. You can almost use the computer like a notepad, marking things on[-screen]. The ability to manipulate the pictures was important… enlarging… to home in on details. Creating tables helped pupils to classify their ideas and allowed them to manipulate what they had found out more easily. 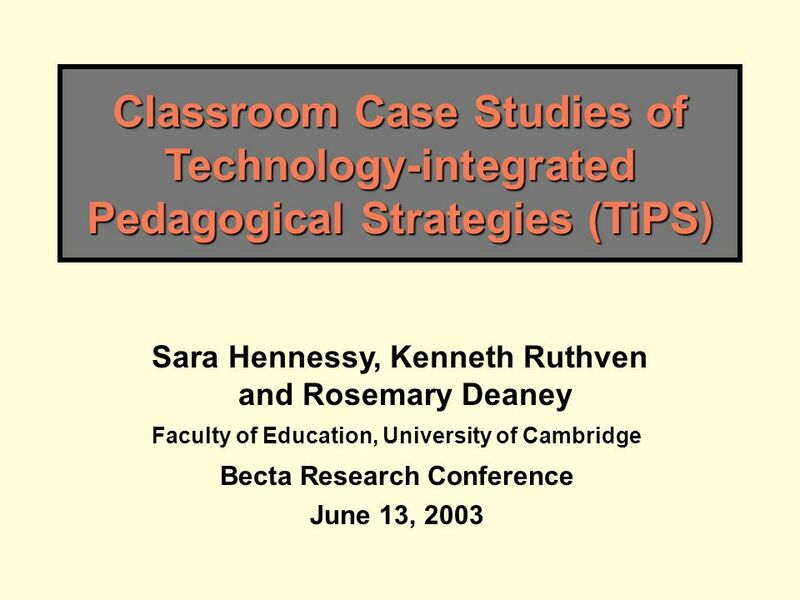 Download ppt "Classroom Case Studies of Technology-integrated Pedagogical Strategies (TiPS) Sara Hennessy, Kenneth Ruthven and Rosemary Deaney Faculty of Education,"
Transforming Practice Jean Dourneen GTE Conference 25 th January 2008. LANGUAGE A1: NATURE OF THE SUBJECT The Language A1 programme is primarily a pre-university course in literature. 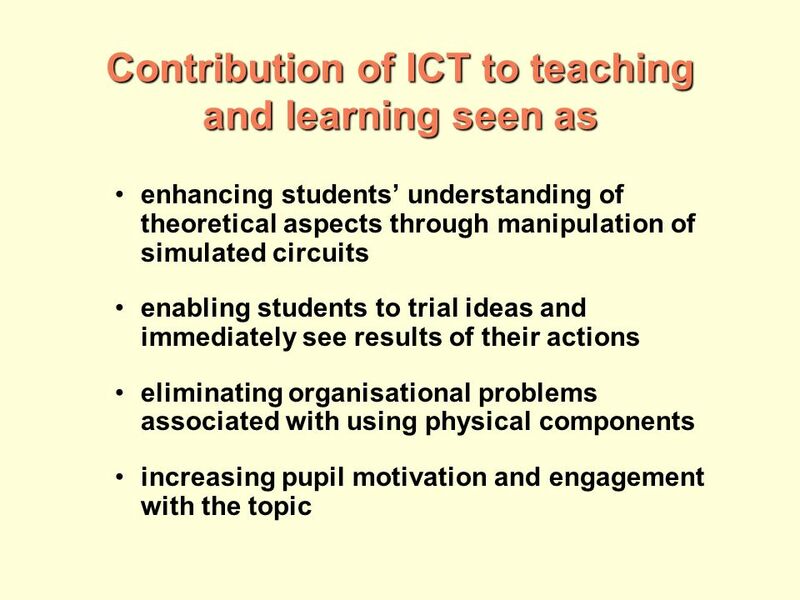 It is aimed at students who intend to. Definitions types added-value tutor role building-up informal learning awareness raising examples 1 Astrid Quasebart ESTA-Bildungswerk gGmbH senior project. 1 The National Literacy Strategy Early Literacy Support Training day 1 Quality First Teaching. GCSE Crossover Coursework Pre1914 texts: Shakespeare and the Prose Study. 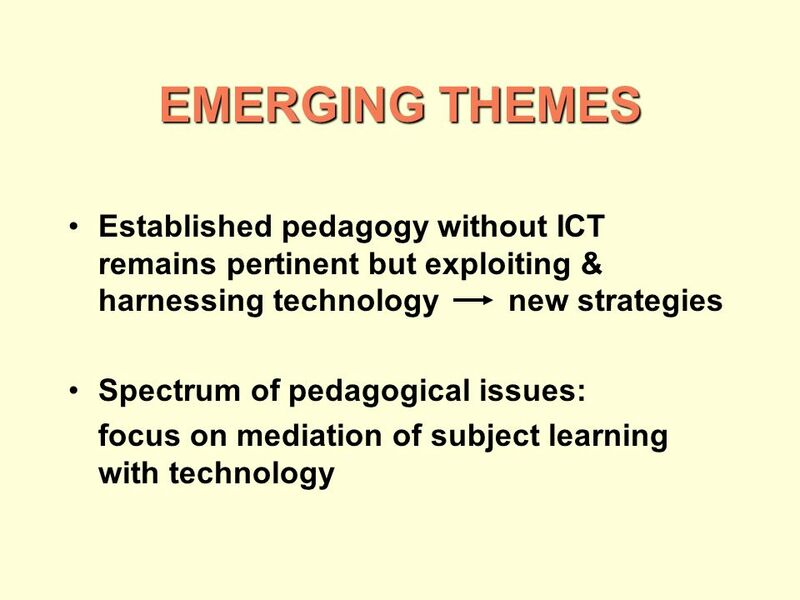 Trends and Issues in ICT By Larey. Focus of Today.. 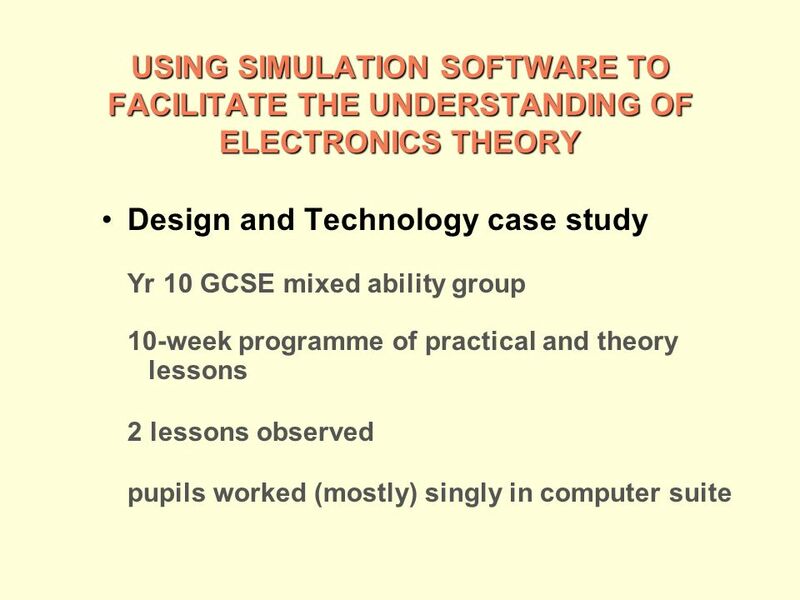 Teaching and learning Secondary School Mathematics with current and future Information and Communication. Interactive Egypt Map Project Overview Teacher Planning Work Samples & Reflections Teaching Resources Assessment & Standards Classroom Teacher Guide Pre-service. Make a difference Welcome A Level Psychology. 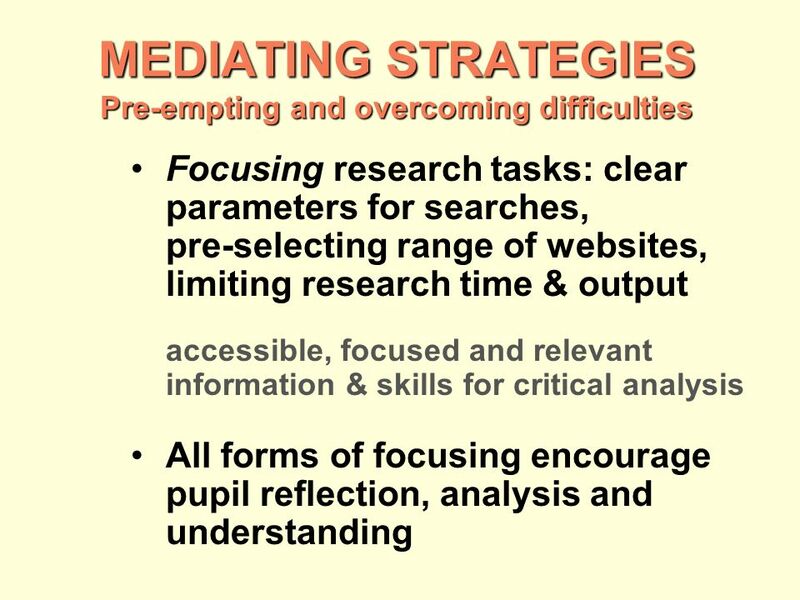 Introduction to OCR Introduction to Psychology Why change to our specification? Support and training Next. INSTRUCTION DOMAIN #3. GROUP WORK How it works: 1.Look at your assigned group and move to the corresponding table. Everyone will take their materials.